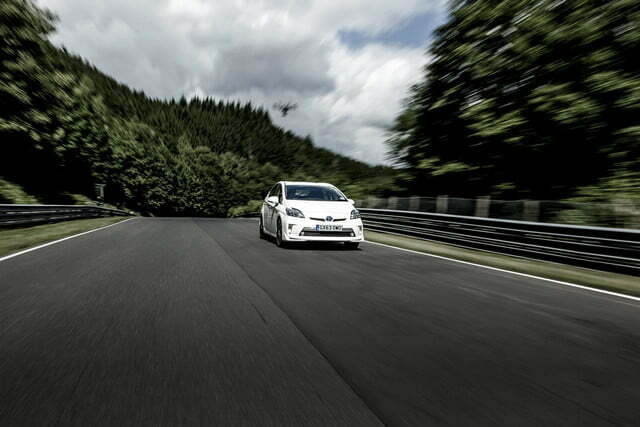 Carmakers are obsessed with the Nurburgring. Seemingly every performance car (and even the odd luxury crossover) has to complete a few laps of the track called “Green Hell” to be considered legitimate. 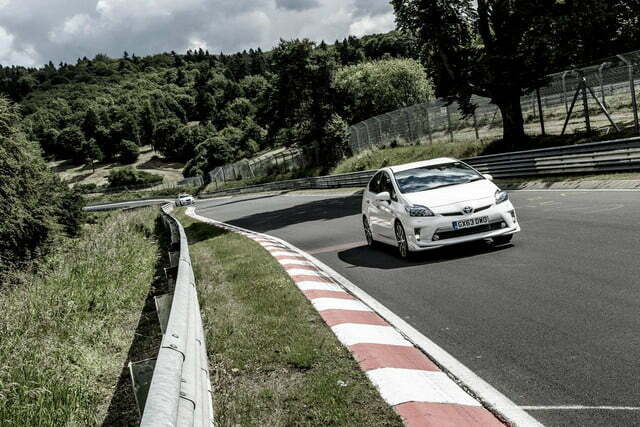 The list of Nurburgring lap records is home to the most sophisticated production performance cars around, and now there’s a new name to add: Toyota Prius. 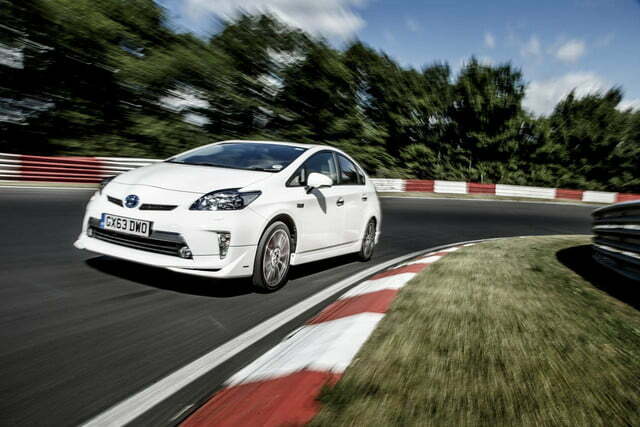 Yes, a Toyota Prius just set a lap record at the ‘Ring, but it had nothing to do with speed. Its 20 minute, 59 second time was practically walking speed compared to the sub-seven minute times clocked by the McLaren P1 and Porsche 918 Spyder. 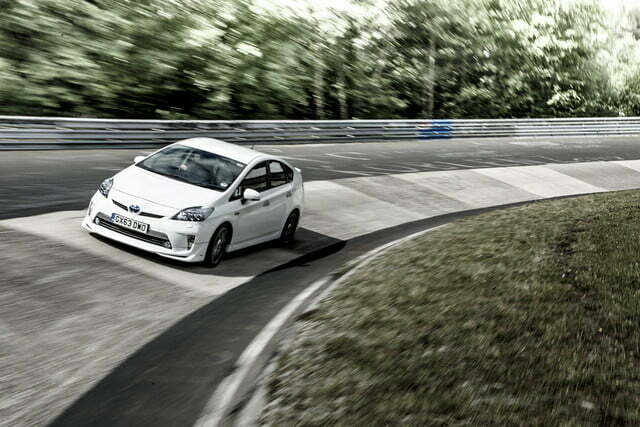 Instead, Toyota pursued a record no one else would have considered. 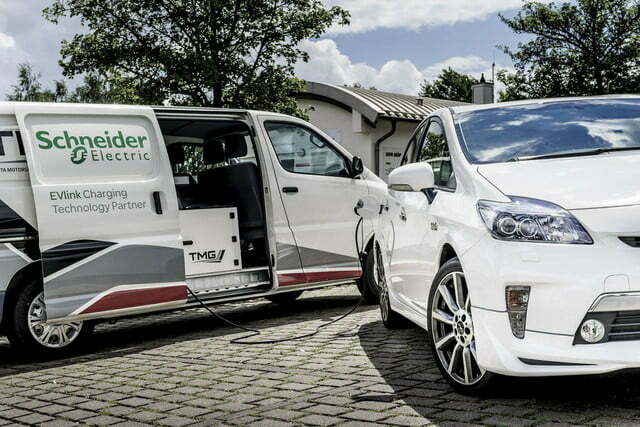 Achieving 581 miles per gallon over the 12.9-mile circuit, a Prius Plug-In Hybrid is now the most fuel-efficient car ever to lap the Nurburgring. To get that incredible figure, automotive journalist Joe Clifford drove almost the entire lap in electric mode; the car’s gasoline engine only kicked in briefly during a long uphill stretch. After driving nearly 13 miles, he used just five tablespoons of fuel. The Prius Plug-In has a rated electric range of 15 miles in European testing and 11 miles in U.S. EPA testing, so completing most of the lap on battery power wasn’t too much of a problem. Speed wasn’t an issue either. The Prius can drive up to 70 mph in electric mode, but Clifford only had to maintain the 37 mpg average required on the track. Other than a TRD body kit (which was just for looks) and low rolling resistance tires, the Prius was completely stock, showing the efficiency can be extracted from cars already in showrooms. However, just like the low lap times achieved by supercars, this performance isn’t something you should try on public roads. Just as it’s inadvisable to replicate the pace of a Nurburgring fast lap on the morning commute, it may not be a good idea to drive like Clifford did. If nothing else, you might die of embarrassment after seeing the traffic jam you cause.